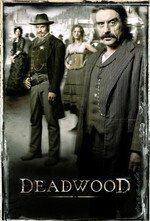 For me, this will always be THE archetypal episode of Deadwood. Two ruthless criminals attempt to negotiate their way through a delicate and highly volatile situation, each hoping to find a solution that will enable them to meet the complex and completely different demands of their two antagonistic subcultures, and the only word they both know is "cocksucker." Not much else to say regarding Swearengen/Wu other than that they're both extraordinarily pragmatic. I think that Al and Wu might actually kind of like each other beyond pragmatism, though. All of Al's scenes involving the dope fiends were phenomenal. It's a little bit weird to me the amount minded about having a preacher in a house of ill repute, on par with a Tong Yun entering through the front door. Different times. I love how peevish Al is about the piano. "Nervousness don't cause that—lying causes cat-piss smell." I think Al's facial expression of respect when Wu gives him the side of meat might be my favorite Al face of the season, at least. Something about the light and his slight staginess to overcome the language barrier. Also great here: the juxtaposition between Merrick's trying to force a walking club on his breakfast companions ("the Ambulators") —which everyone more or less gently rejects, despite Merrick's enthusiasm—and the closing walk with friends that Seth and Sol suggest to the distressed Reverend, not a demanded, ratified club but a response to his need. Forms of community—Al and Wu, hardware men and reverend—taking occasional but necessary shape. I am, as no doubt others are too, rather overcome by our national circumstances; I'm glad this is still happening, though, and will try to keep checking in. Note that Al tells EB not to steal any of the bribe money, but apparently a bit too late - EB already has a new coat. Huh I'd noticed that, but I'd always thought that it was EB's sense of position as mayor that drove him to update his wardrobe. We know he's not a poor man, just stingy.